Why Singapore Life Insurance Agency Distribution Channel Is Game Over! 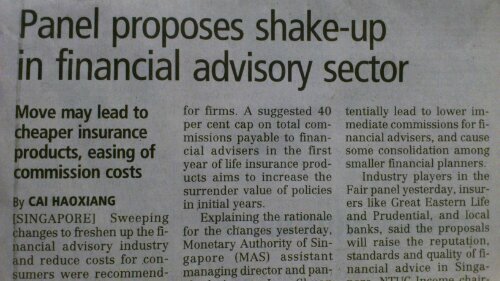 Over the last 12 years Singapore life insurance sector has been going through waves of changes. (3) Making costs of life insurance more transparent. However, to date the outcome is still not promissing and therefore, another round of panel (committee) review is carried out. 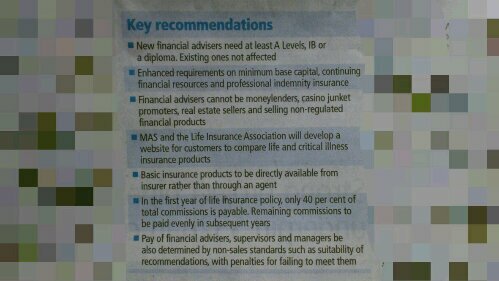 Based on the above recommendations, two apects of life insurance distribution will be severely affected; (1) with direct sales of life, health and term insurance products to customers without commission charges, most life insurance agents cannot survive in the industry; (2) insurance agency supervisors and managers no longer able to bear the costs of recruiting and grooming new (and effective) agents, due to falling Overriding commission income. Overall, it is envisaged that Singapore life insurance agency distribution channel will continue to decline (in quality) and go into a vicious cycle – producing even lower quality personalized service to clients. You can’t get talents to join this sector with recommended commission squeeze. One way is to cap the level of life insurance agency size (by regulation) for the entire sector and for insurance operators and also, to further raise its entry standard keeping abreast with financial sector such as banking and investment field. As it goes, it is known that currently only 1/3 of insurance agents are truly effective and of minimum service quality standard. Insurance operators should again consider Direct-service agents under proper and competitive salary scheme with performance (and quality service) based payouts. This approach paired with direct sales of whole-life, health and term products will work very well in effectively raising service level for customers.